Sprinkle walnuts in ungreased heavy skillet. Cook over medium heat 5 to 7 minutes, stirring frequently until nuts begin to brown, then stirring constantly until nuts are light brown. Meanwhile, in small bowl, mix oil, lemon juice, shallot, brown sugar, mustard, salt and pepper with whisk. Cut beets and carrots into thin slices, using mandoline or sharp knife. (To prevent hands from being stained, hold beets with paper towel or wear rubber gloves while slicing.) Toss arugula with small amount of vinaigrette. Arrange arugula on serving platter. 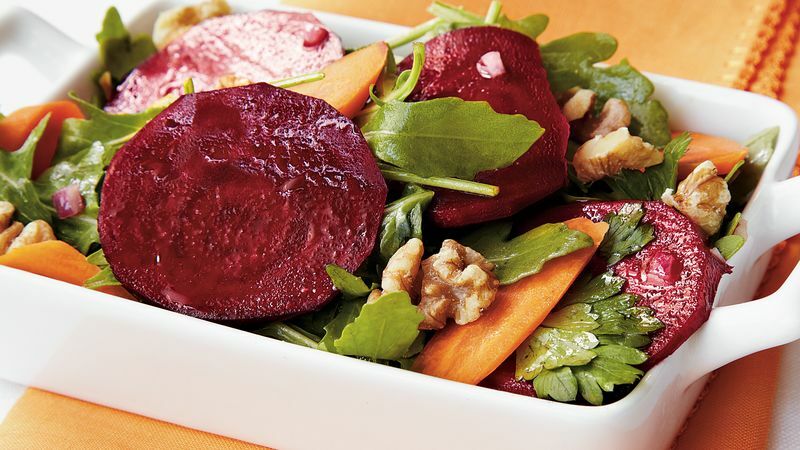 Toss beets, carrots and parsley with desired amount of vinaigrette. Spoon mixture over arugula; sprinkle with walnuts. Season with salt and pepper, if desired. Serve immediately with any remaining vinaigrette.